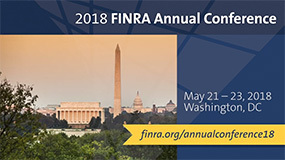 FINRA's 2018 Annual Conference took place in Washington, DC, May 21 – 23. The conference was designed to help participants—both seasoned compliance veterans and those new to the industry—navigate toward a strong culture of compliance. With more than 50 sessions, over 1,600 participants learned about the latest regulatory developments and FINRA priorities, and gained practical guidance on today’s top compliance issues and how to maintain an effective compliance framework. Recordings of sessions are available to FINRA member firms and CRCP graduates. View the recorded sessions from the May 21 – 23, 2018, FINRA Annual Conference, and receive access to all conference materials. View the conference brochure below for a list of recorded sessions and their descriptions. 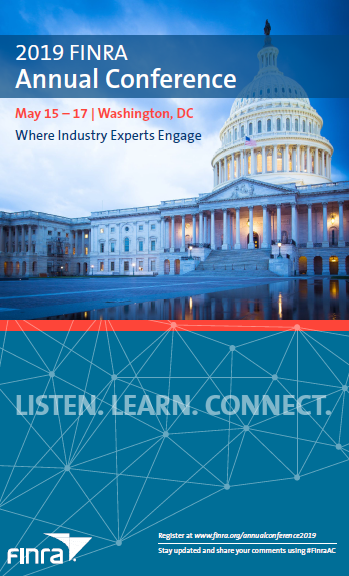 Registration is now open for the 2019 Annual Conference in Washington, DC, on May 15 – 17. Reduced rates are available for the first 100 in-person registrants before October 1, 2018. Receive email updates on this and other FINRA Conferences.